Follow along for a multidimensional literary adventure. Ever since Homer set Odysseus off on his epic journey, the road trip has been a classic setup for storytelling. Longtime English teacher and technology-integration coordinator Jerome Burg always looks for ways to bring students close to the action when teaching literature's great travel tales. By combining literary road trips with the interactive technology and satellite imagery of Google Earth, Burg says he has found a way to put students "right in the back seat" of an unfolding journey. Burg created the site Google Lit Trips to share his innovative approach for teaching literature at Granada High School, in Livermore, California. His award-winning site enables users to download ready-made "lit trips." Each trip is an interactive multimedia experience created using Google Earth and stored as a KMZ file. (Although they may sound complex, KMZ files that run Google Earth are relatively easy to create and navigate.) Following Burg's lead, teachers and students are creating their own virtual literary trips and sharing them with the online community. To follow a Google lit trip, start by downloading the free Google Earth program. If you have not used the program before, spend a few minutes getting familiar with how the various tools work to navigate around the globe. (Hint: Search for your own home address in the search window at the top left of the screen, then watch as the three-dimensional viewer of the globe zooms in on your rooftop. After that, "fly" to your school address. Zoom out for a view from space, or focus in close enough to see the soccer field.) For more help with the program, check out this Google Earth tutorial. 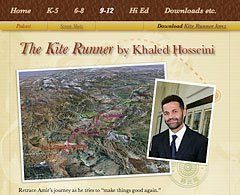 To see the learning potential of a lit trip, Burg suggests taking a look at the trip he recently created to help high school readers explore a contemporary novel, The Kite Runner. (From Google Lit Trips, click the link at the top of the page for grades 9-12, then choose the link for The Kite Runner.) Using the interactive file, readers can virtually follow along with the character Amir on his journey back to his native Afghanistan to, as he puts it, "make things good again" with a family he knew as a boy. 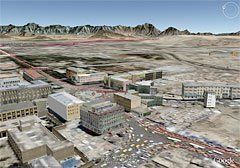 When students open the KMZ file, they will see satellite imagery of the globe in the 3-D viewer, and the image will spin before it stops on Afghanistan. Burg has marked key locations with "placemarks" color coded to relate to specific chapters in the novel. The sidebar on the left of the screen organizes all the geographic information by chapter as well. Using easy-to-navigate Google Earth tools, students can zoom in for a closer look or tilt the view to see the terrain or buildings in 3-D. They can virtually fly from place to place, following Amir as he travels from California to Afghanistan and back again on his quest. By clicking on a placemark, students open a pop-up window embedded with supplementary information. One window shows a photo of a bazaar, accompanied by a passage from the novel describing a musty marketplace. Another explains the cultural history of the Pashtun people and has links to additional information about Shia and Sunni Muslims. Most pop-ups include photos, maps, drawings, or text but also have questions to encourage students to think about the story. Exploring the placemarks involves active engagement that Burg compares with using manipulatives for hands-on learning in math. "It puts the kids right in the middle of the story," Burg explains, "rather than at a desk as the teacher teaches the story at them." Students can also add their own placemarks, highlighting locations or links that add to their understanding. With a few quick steps, you can be on your way to using a ready-made Google lit trip or to creating your own Google Earth files for place-based literature studies. If you have never tried doing such a study, you may want to begin with a ready-made lit trip. Search the Google Lit Trips collection by grade level and find a title that's right for your students' reading level. Explore the trip yourself so you are familiar with the placemarks and other resources before showing your students how to follow the journey online. If you want to create your own lit trip, choose a book or story that has a strong sense of place. A good story for a lit trip doesn't have to involve a long journey. Even a place-based poem, such as "The Midnight Ride of Paul Revere," can work, Burg says. Tutorials on the Google Lit Trips site take you step-by-step through the process of adding placemarks and embedding multimedia information. At the top of the home page, click on Getting Started, and watch the demonstration videos that show you how to use this resource. As you plan a lit trip, think about information that will help your students envision places they have never seen. Carol LaRow designed a Google lit trip for middle school readers that focuses on the historical novel My Brother Sam Is Dead. (To get there, go to the Google Lit Trips page, click the link for grades 6-8, then choose My Brother Sam Is Dead). The educational-technology consultant has embedded a wealth of visual material: maps showing the routes taken by patriots and British soldiers, photos of colonial-era buildings that are still standing, and paintings depicting famous battles. There are also discussion questions that students helped write. To navigate through LaRow's lit trip, use the sidebar to the left of the 3-D Google Earth viewer. Click on the folder for chapters 1-5, for example, and you will open all the placemarks relating to those chapters, organized to follow the sequence of the plot. Click on the marker labeled "Boston-British March," and the 3-D viewer shows a map of the soldiers' route. Click on the next marker for "Paul Revere's Ride," and an image of the famous patriot on horseback pops up while the 3-D viewer zooms in to the city of Boston. For younger readers, Georgia teacher Michelle Wilkes and technology specialist Diane Barfield teamed up to create a Google lit trip for The Yellow Balloon. (From the home page, click on the tab for grades K-5. Scroll down to find the link to The Yellow Balloon.) This is a picture book with few words, just right for Wilkes's first graders. The lit trip helped her students find examples of geographic features described in the book, from volcanoes to jungles to big cities. As a class activity, students suggested locations and definitions to include on the map. Wilkes says the activity expanded her students' global awareness along with their vocabulary. 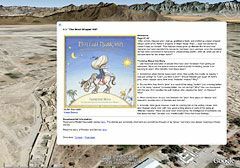 Combining Google Earth with literature study allows teachers to come up with activities that are highly creative for their students. Instead of having students use this powerful tool just to make a plot summary, Burg suggests nudging them toward activities that will generate higher-order questions and more analytical thinking. Using the lit trip for The Grapes of Wrath, for example, a teacher could set the stage for a classroom discussion about current immigration issues. That would encourage students to connect the book to issues affecting their own lives. As they read a text, students can look for significant locations or information to add to their map. For instance, for a story in which an act of nature plays a prominent role, students may want to investigate extreme weather patterns or use Google Earth to peer into the crater of a volcano. They can add annotated links to sources they have researched, building their information-literacy skills. Students can also add placemarks to pose questions, setting the stage for robust classroom conversations. As teachers from around the world start to share ideas for making the most of this resource, a new conversation is brewing about best practices for technology-rich literature studies. The Google Lit Trips site houses a growing collection of podcasts, screencasts, conference links, and video interviews that capture the insights of lit-trippin' teachers from around the world.